June 6th marks the 50th anniversary of the death of Yves Klein, the noted French post-war artist. Known in circles for his influence on pop, minimal, avant-garde, and performance art, he is most famous for the color he codified, International Klein Blue. Not your ordinary Crayola-box blue, this particular pigment was carefully crafted—Klein wanted to recreate the brilliance of dry ultramarine in wet form. He finally found his recipe, mixing the raw pigment in a synthetic resin called Rhodopas. 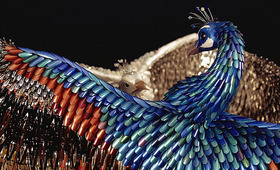 The effect was nothing short of brilliant; similar to lapis lazuli mosaics of ancient civilizations. Set against stark contemporary walls, Klein's monochromes and body art simply hypnotized the eye. We sense a new zeitgeist for this extraordinary color—which is ever-present in our community—and see its resurgence in new and developing beauty products. The makeup community craves the richness and purity of this kind of blue—in resin-like jelly lacquers, velvety soft powders, and full-bodied, creamy pigment. 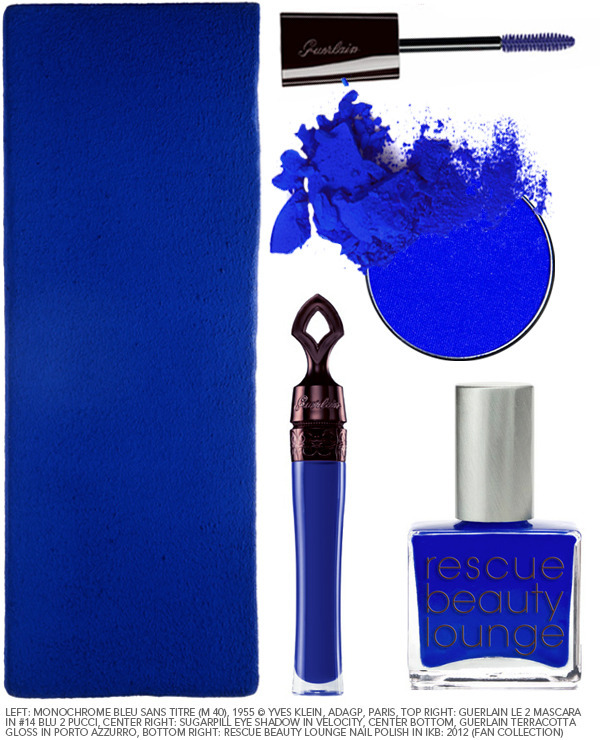 Rescue Beauty Lounge's IKB: 2012 launched from a fan request; an example of the public demand for Klein's ultramarine (and already sold out!). 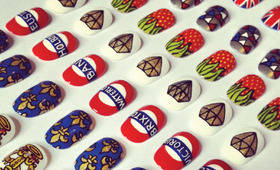 The custom-created, jelly-textured nail color is a near reproduction of the iconic hue, and gives a high-gloss veneer with three coats. Velocity, a matte cobalt from Sugarpill's newest Heartbreaker palette, has a comparably vibrant, sapphirine payoff that doubles as eye liner. 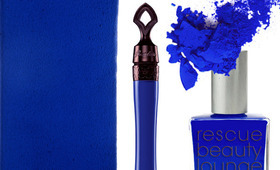 And while tinted slightly darker and with a touch more violet, Guerlain's limited edition Porto Azzurro gloss and Blu 2 Pucci mascara present radically unique ways to entertain the beauty and purity of Klein's blue onto lips and lashes—as the artist accomplished with his performance and body art. The blue epoch is ablaze in full force.